Designed and built in 1915 by Prairie School architect Francis Barry Byrne, an associate of Frank Lloyd Wright, this residence is historically significant and perhaps the most distinctive property in Fairfield and Jefferson County, Iowa. Listed on the National Register of Historic Places, and exquisitely restored, the J.F. 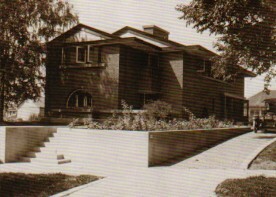 Clarke residence has been published in magazines and architectural history books and was featured in a major architectural exhibit at the Chicago Historical Society. This 3,500 square feet home offers an environment of beauty, art and history with over fifty stunning original artglass windows and French doors, restored wall stencils by famed Arts & Crafts artisan Alfonso Iannelli, exquisite original period light fixtures, furniture designed just for this home, and set in a lovely wooded 0.6 acre lot just four blocks from the central square. Even the garage doors have artglass. Deep overhanging eaves, and the rows of artglass windows create a spaciousness and intimacy with the wooded landscaped yard. Every room but one has southern exposure filling the house with warmth and light. Here, one feels at one with nature, and simultaneously enjoys a sense of shelter and refuge. The J. F. Clarke residence is for sale (it has since been sold). This is a unique opportunity for those who appreciate timeless refined design and exquisite craftsmanship. The J. F. Clarke residence would be an ideal family home set in a delightful small midwest town, or for a retired couple who enjoy entertaining. Alternatively, the property could be an exceptional value for an investor. The owner seeks a surprisingly modest price. Downstairs, enter the home through a gracious foyer, then go into a living room perfect for entertaining with fireplace, a wealth of artglass windows and doors, original period furniture, unique original lighting, and period lithographs. Enjoy dinner for eight in a dining room furnished with the original dining set, sideboard, built-in china cabinet, and historic chandelier. Move to the brick and glass sunporch for apres-dinner drinks and conversation. Also in the downstairs are a 1980-era kitchen with an original floor-to-ceiling glass door pantry, half-bath, and storage closets. Upstairs, four ample bedrooms are adorned with artglass and built with massive brick walls and vaulted ceilings. These rooms are very silent and filled with a sense of warmth and security. The luxurious master bedroom suite includes a dressing room with cedar closets, private bath and an enclosed sleeping porch. There are, in addition, a study (or fifth bedroom) and a maid's room with its own private bath. Each room has beautiful wood trim, hand-stenciled designs, a sunny southern exposure, and countless quality cast brass fixtures. The quality of materials and craftsmanship is a constant delight. One is quietly surprised again and again by unobtrusive magical details. And there are eleven closets! The basement offers an immense amount of storage (or a shop or a playroom) in five rooms and a laundry room with many original built-in cabinets, two separate recently updated heating systems, and direct garden access. 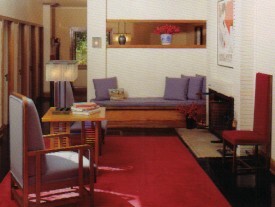 The J. F. Clarke residence is set back from the street on a wooded 0.6 acre lot. Landscaping includes a variety of trees, shrubs, ground covers, and flowering plants. Again, small touches like flower boxes and hidden fountains surprise and delight. The driveway is done in brick pavers. The house is a pleasant four-block walk from the vibrant central square of Fairfield and nothing in town is more than a 5-minute drive. Cable TV and high-speed internet (with optional super-speed fiber-optic internet service) link the house to the globe.